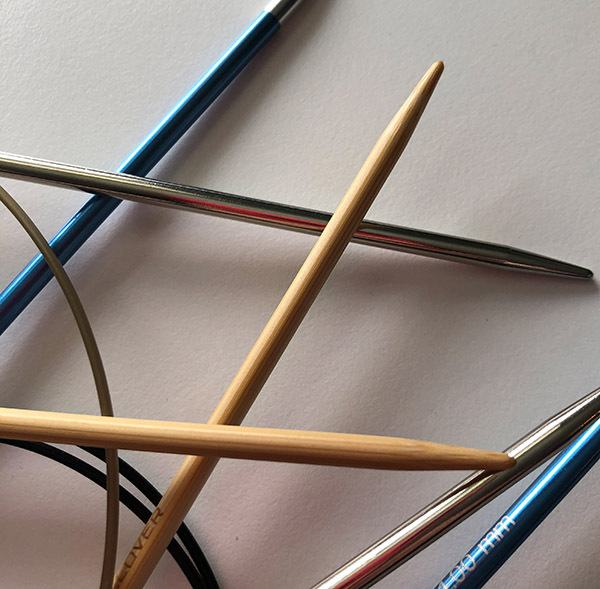 Picking these three things is the holy grail of knitting! We have lots of options, but it shouldn’t paralyze you into not making any choice. Or, worse yet, just throwing your hands up in the air and “choosing” to just use what’s on the ball band. This is probably the easiest of the three. Are you attracted to a specific color? Or maybe, you’ve used the yarn before, so you already know what to expect. Don’t limit your choices just to what you know and have used before. There are SO MANY great options available – different colorways, unusual spins/plies and even branching out into other fibers. Haven’t tried a chainette ply before? Or, maybe that one cotton you used really hurt your hands so you swore it off. For me, I used a single yarn way back in the day and didn’t like it, so I swore off all singles after that. Fortunately, I tried it again because I LOVE LOVE LOVE singles and the way they take the dye. I’m so happy I tried it again because I learned just how much I love them. If you’re curious to read more about yarns, fibers and how to evaluate if one yarn is good when another was recommended, the Knotions post on substituting yarns can be a great tool for you to use. You probably have your favorite brand of needles, tip type and material choice (for me, it’s metal ChiaoGoo Needles) but that doesn’t stop me from keeping other needles in my stash. I use them when they fit the bill. Your Own Way of Knitting – Do you tend to knit tightly? More loosely? This is probably something you adjust for without even thinking about it and you probably say something like this to yourself “well, they suggest a US#8, but I know that’ll be a US#6 for me”. If you do something like this, then you’re well on your way! Material – Do you want the grip of a wood? Or maybe, you need the slickness of metal. They both have their uses (and I even have several pairs of DPNs even though I don’t ever use them in the “traditional” way for small-circumference knitting. Size – Are you looking to work the yarn at a “regular” gauge? Or maybe, you want to make it tighter (often, this is the case with socks). Or possibly, you’re making a lace piece and you want a bigger needle so it’s airy and light. All these options can make sense! The gauge on the ball band is really just a suggestion and isn’t meant to be an “all other gauges are subpar” kind of statement. Gauge is such a personal thing, and I really don’t think you can make a good decision until you’ve worked up a few gauge swatches to see. The same yarn can be worked in a variety of gauges, and, depending on the application – EVERY ONE OF THEM is worthwhile and valuable. This is just another way of saying to respect your thoughts, respect your impressions and take into account how you expect the piece to be worn and laundered afterwards. Yarn, needle and gauge don’t have to be a mystery! In fact, at this point in my knitting journey I can often see a yarn and think “I’ll use these needles and this gauge”, but there are times when even I just don’t know. And in those times, working a gauge swatch is really my only answer. The important thing is – don’t be limited by what the ball band says. Use it as a guide – but only as a guide. It can tell you important things, just don’t treat it like it’s written in stone and is never to be strayed from because you’ll miss out on some great options! 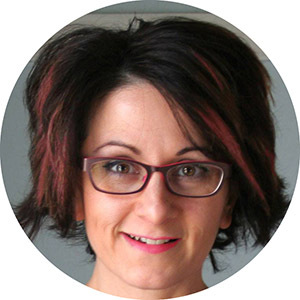 About the Author – Jody Richards is the founder of Knotions Magazine and has been an avid knitter and crocheter for almost 40 years. 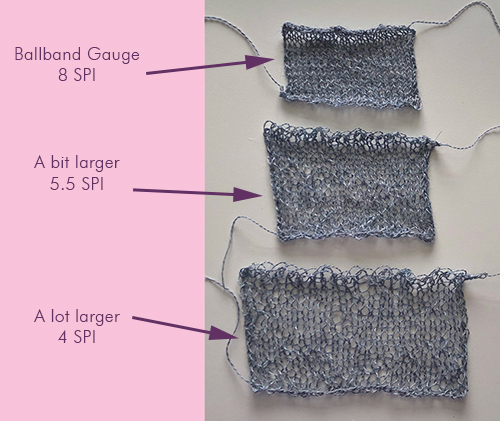 Her mission is to make sure that people don’t put garter stitch edges on their gauge swatches (read more about them in this post) and she thinks that both knitting and crochet are viable crafts. Ready Set Knit! Show 549: Kathy’s Year End Review With Carol Sulcoski and Our Last Episode! 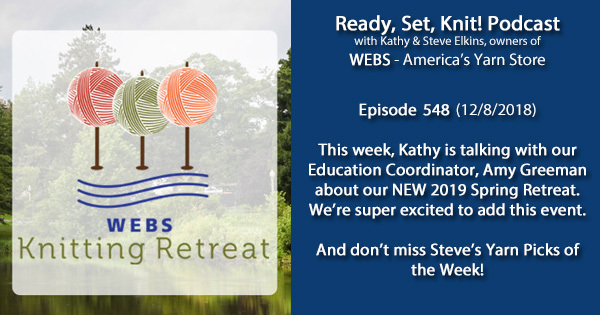 This week is our very last episode of Ready, Set, Knit! 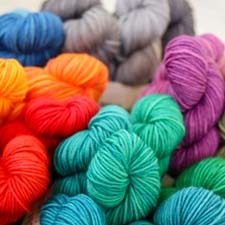 While it’s bittersweet for us here at WEBS, as we will miss sharing our yarn picks each week and chatting with guests about the goings on in the store and the fiber community, we’re so excited to move on to other things and are soooo looking forward to a bright and yarn filled 2019! 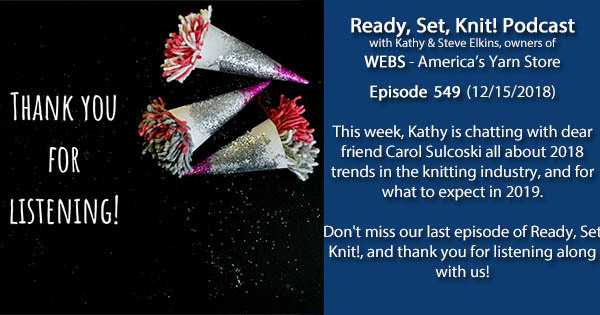 Listen to hear Kathy talk with Carol Sulcoski all about knitting trends from the past year, and to hear more about what to expect from the fiber industry in 2019! Thank you for listening to the past 549 episodes with us! 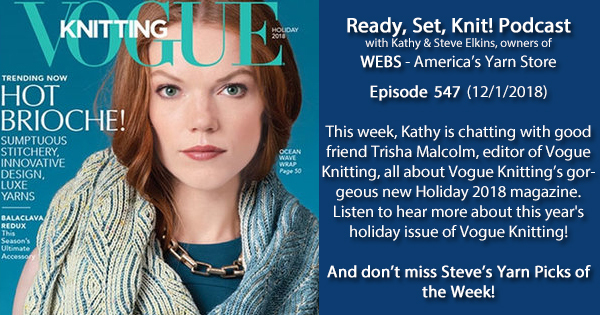 This week, Kathy is talking with one of our dear friends, Trisha Malcolm of Vogue Knitting, all about their latest issue for Holiday 2018! Hear all about what’s hot for the holiday season this year, and to hear some special news from Trisha about a podcast Vogue Knitting is developing in 2019! And don’t forget – WEBS and String will be at Vogue Knitting Live in New York City in January, and we couldn’t be more excited! To get your own copy of Vogue Knitting, click here! WEBS will be having a SPRING RETREAT in addition to our popular Fall retreat! Click here to check out more information! Signups begin on January 17th at 1pm! Don’t miss out!! 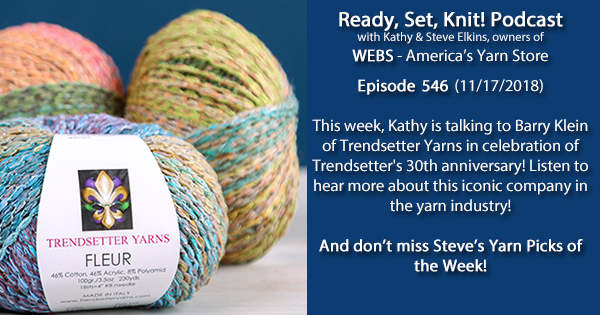 This week, Kathy is chatting with Barry Klein, one of the founders of Trendsetter Yarns, who are celebrating their 30th anniversary this year! Listen to hear more about one of the most iconic companies in our industry! On Saturday, November 17th and Sunday, November 18th, WEBS will be participating in Northampton’s Bag Day – one of our favorite town traditions! Get a bag from the Daily Hampshire Gazette (located right across the street from us!) and stop by the store to get 20% off of your largest non-discountable item in your purchase. This includes wheels, looms, needle sets – whatever you choose! Also – Sunday the 18th of November marks the first Sunday that WEBS will be open for the holiday season this year! We’ll be here from 12-5 for all of your holiday shopping needs! This week, we’re delighted to have Amy Herzog back on the show! 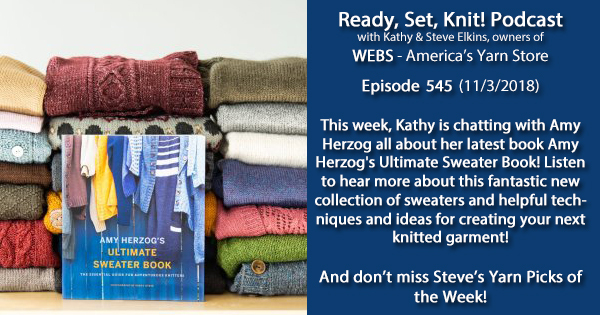 Amy has just published another fantastic book: Amy Herzog’s Ultimate Sweater Book! This book contains gorgeous patterns, ways to work with different yarn gauges to fit your size, and tons of inspiration! You’ll definitely want to add this one to your list this fall! 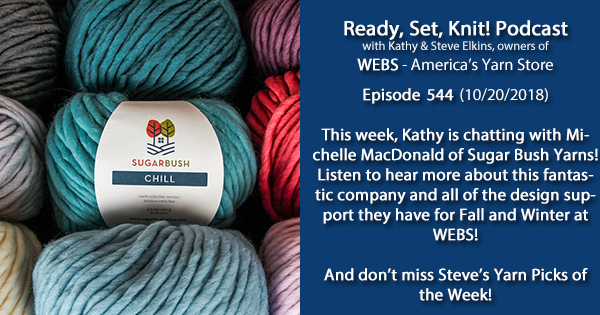 This week, Kathy is chatting with Michelle MacDonald of Sugar Bush Yarns all about their offerings at WEBS! Sugar Bush’s Chill and Bliss have quickly become two of our favorites for fall and winter 2018! 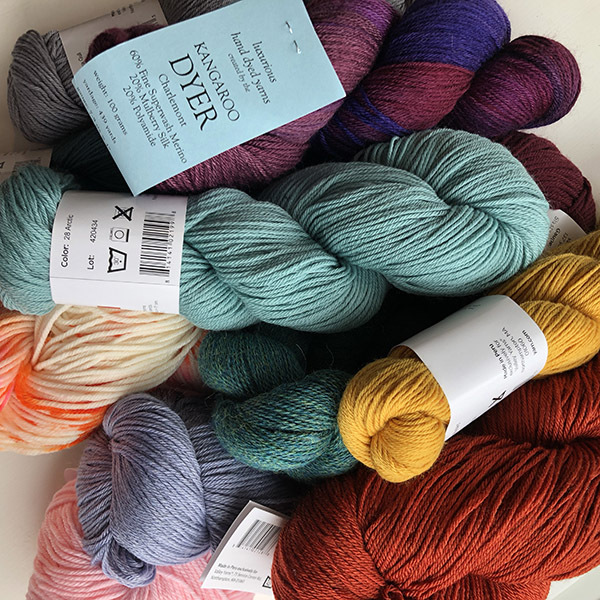 With gorgeous design support, natural fiber content, and beautiful colorways, yarns from Sugar Bush are sure to become some of your favorites, too! Looking for something to do this fall? Check out the full list of WEBS class offerings over here! This week, Kathy is chatting with Benjamin Levisay of XRX! 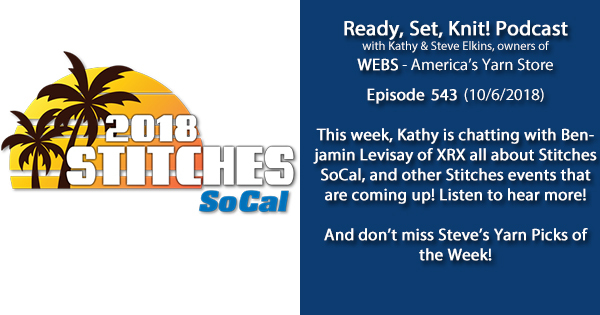 Listen to hear them talk about Stitches SoCal, one of the newest shows in the Stitches family, which will be taking place in Pasadena, California from November 1st through November 4th. This year, there are a ton of great classes being taught by fantastic fiber artists and friends of WEBS – sign up soon so you don’t miss out! Sadly, we won’t be at SoCal, but we WILL be at Stitches West, happening in February. To check out class offerings, click here! On October 28th, WEBS is hosting an evening with knitting superstar Sam Barsky! We’ll be hosting a lecture with cocktails and light hors d’oeuvres , and you’ll be able to see over 100 different sweaters that Sam has made over the years. For more information, click here! There’s still some room at the WEBS Spinning Summit happening at the store! For more information and to sign up, click here! 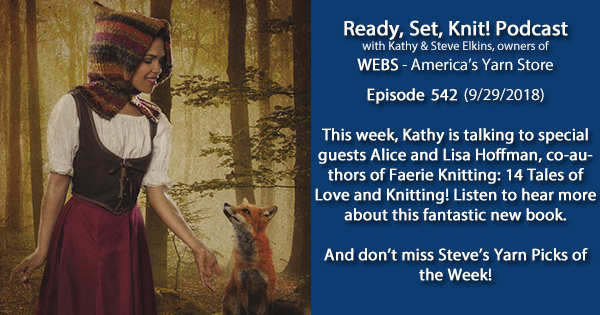 This week, Kathy is chatting with cousins and co-authors, Alice and Lisa Hoffman, all about their new book, Faerie Knitting: 14 Tales of Love and Magic. This publication includes patterns with corresponding stories, and features gorgeous photography to tie it all together. To get a copy of your own, click here! 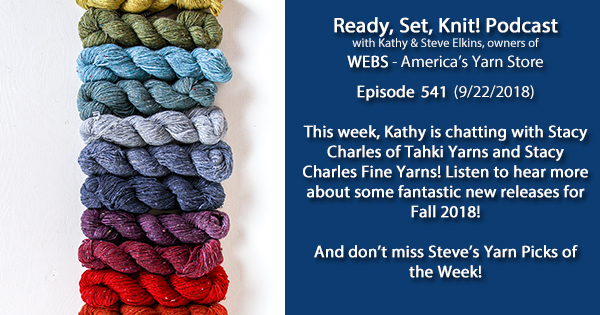 This week, Kathy is talking with our dear friend Stacy Charles, of Tahki Yarns and Stacy Charles Fine Yarns. Listen to hear more about the gorgeous collection of yarns and pattern support for Fall 2018! Click the links below to check out each new Tahki yarn! Check WEBS out at Vogue Knitting Live in San Francisco! There’s still room on the WEBS Rhinebeck bus! Click here to reserve your space! Spinning Summit will be happening again this year in October!